Clarity Connect ToolBox | Plant Database Mgr: Staff Favorites Managment and Employee Profiles Editor and the Plant Database Manager. All of the staff's favorite plants are shown at the bottom of their profile. Personal recommendations are one of the best ways to sell. Your staff can 'sing the praises' of some of their favorite plants by combining the Managment and Employee Profiles Editor and the Plant Database Manager. 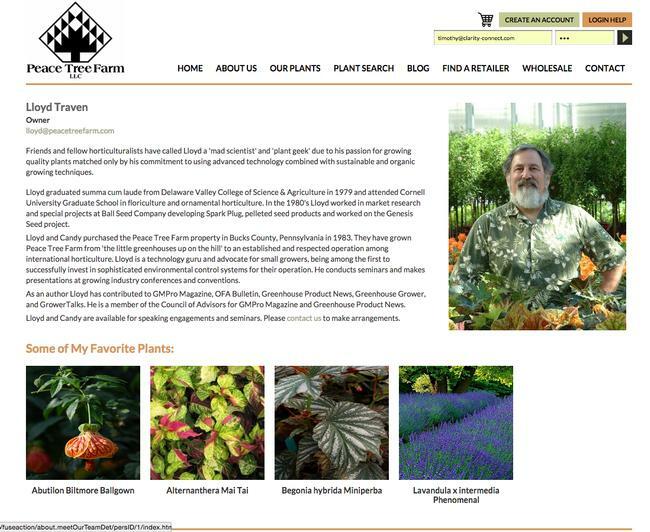 After creating your staff profiles, you can then add their comments to some of their favorite plants. Their comments will display on the corresponding plant detail page. Additionally, a picture and name of their favorite plants will display under their staff profile. Those images link to the corresponding plant detail page. For this system to work, you will need both the Management and Employee Profile Editor and Plant Database Manager.